You need at least one image for every piece of content. Finding images is easy. Finding good images in big enough resolutions is very difficult and often ridiculously expensive. To make matters worse most commercial stock photo sites have images that look, well, like they are downloaded from a stock photo site. Thankfully there are free (anti) stock photo sites that solve this problem. Images can enhance a post. They can also grab visitors’ attention and keep them actively reading your stories. You can use pictures to showcase something, guide users and explain things in more details or simply break the text and allow your readers to rest their eyes. While everyone already knows the importance of media files in blog posts, many bloggers struggle when it comes to finding right images. Not all of us are photographers who can take all the pictures by themselves. And if you start searching for photos online, the chances are that you will stumble upon great photographs that cost much. Yeah, we know that you probably know how to steal a picture from another website; but trust us, that’s not something you want to do if you are serious about your site. Sooner or later, those stolen images may get you in trouble. Luckily, there are some fantastic sites that offer free stock photos you can use anytime and anywhere you want. Before proceeding to the list, do you know what stock photos are? Stock photography is a great resource of various images available online. Instead of hiring a photographer or generating your own files, you can quickly search for a topic of interest. 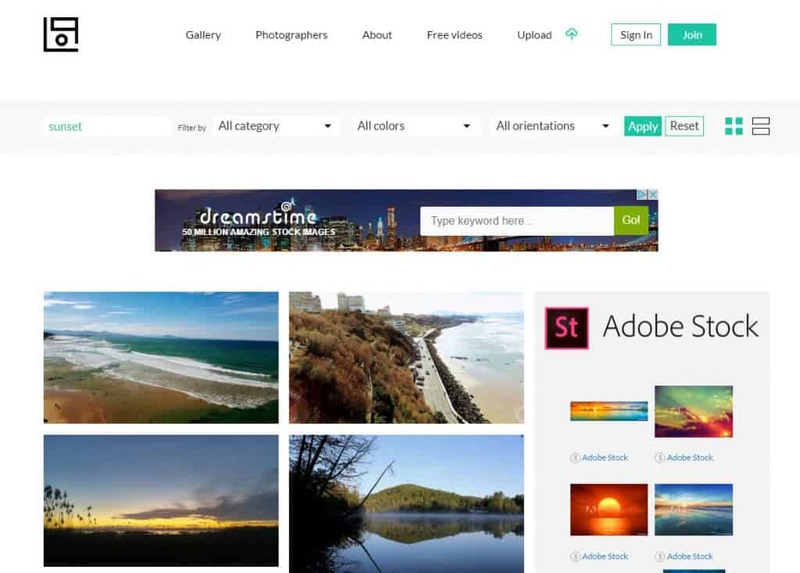 A stock photo site will show you all available images that you can quickly download and use on the blog. For example, we could have used any of the free stock photo sites to find images for Under Construction Page themes. Instead, we had a professional designer come up with unique graphics. Finding professional photos that can cost up to several hundreds of dollars isn’t that hard. But finding great images that you get to use for free might be a challenge. 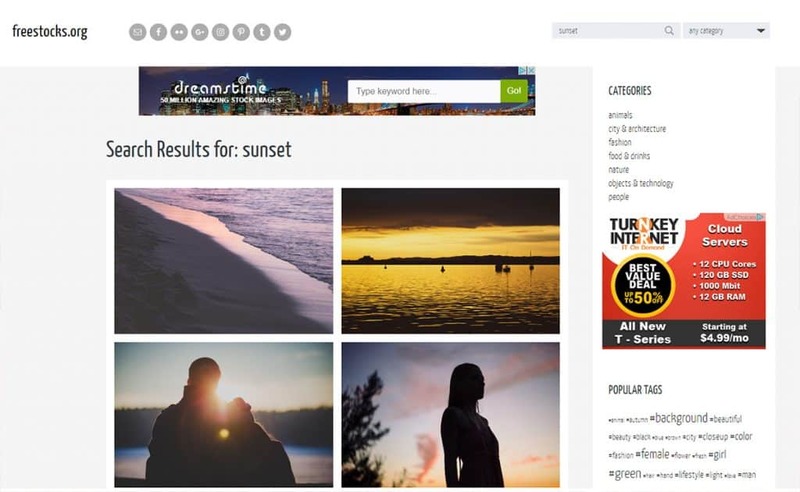 So, in this article, we are about to show you a collection of websites that provide free stock images that you can start using right away. 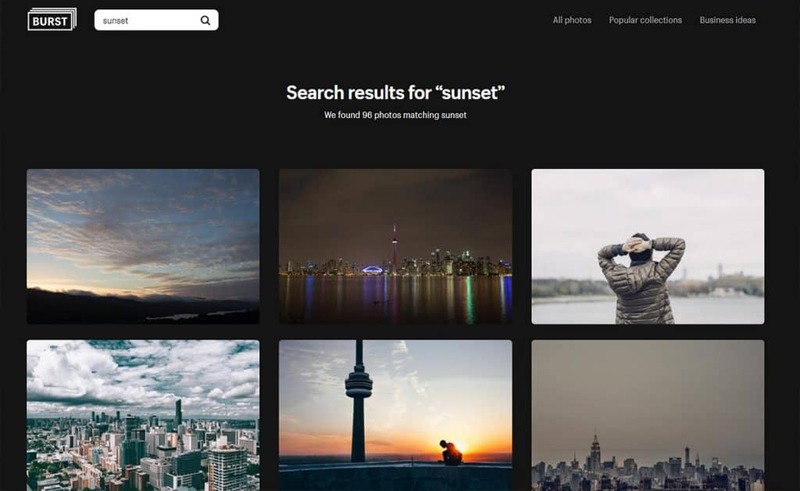 Note: all of the screenshots below were taken after we searched for “sunset” images on every site. Since it’s very difficult to compare sites and decide which one is “better” we feel this is a fair comparison. Undoubtedly, Unsplash is one of the most popular free stock photo sites. It offers more than 200,000 photographs that are entirely free, so you can relax and start using them on your blog. Since there are more than 40,000 users registered on the website, you can expect new photos added to the library every day. This amazing site brings you hundreds of free photos per week. New ones are added in the database on a daily basis. Since all StockSnap photos are released under Creative Commons – CC0 they do not require attribution. Just pick images you like, download and put on your site. Taken by Ryan McGuire, all images on Gratisography are completely free. You can use them on personal and commercial projects without worrying about the licenses. All you have to do is search for a picture you like and download it in high resolution. Images are added on a weekly basis so don’t forget to stop by every now and then to check for new ones. FreeStocks features seven categories and even more tags you can use to find images that you need for your blog. You can use them anywhere you like, no matter if it’s a personal or commercial project. Simply hover over the image to access the download link. On Negative Space, you can find twelve categories of entirely free stock photos. There are even several popular collections you can quickly get access to so you get to easily find photos of iPhones, MacBooks, code, UX, and many other. Just like previously mentioned sites, images on Negative Space are completely free both for personal and commercial use. Pic Jumbo was created by Viktor Hanacek who enjoys both photography and technology. The simple project quickly grew into a fantastic photo resource that is being used by millions of users worldwide. Browse the latest photos or search for ones within multiple categories. Of course, all photos that you find there are free to use. With more than one million available photographs, vectors, and art illustrations Pixabay definitely deserves your attention. All photos on the site are ready for download, modification, and distribution on any websites that you need. You can use them royalty free and without attribution. Free Images features almost 400,000 photos that you can download anytime you want. There are quite a few categories you can browse and a nice search feature that will instantly connect you to any search phrase. Picography is maybe the simplest of free stock photo sites you can find. You get to search for images, scroll through the list of the latest ones, or browse the premium collections. No matter how you get to them, you get to use pictures free of charge, even for commercial projects. Life of Pix is created by Leeroy creative agency and offers free photos on a weekly basis. 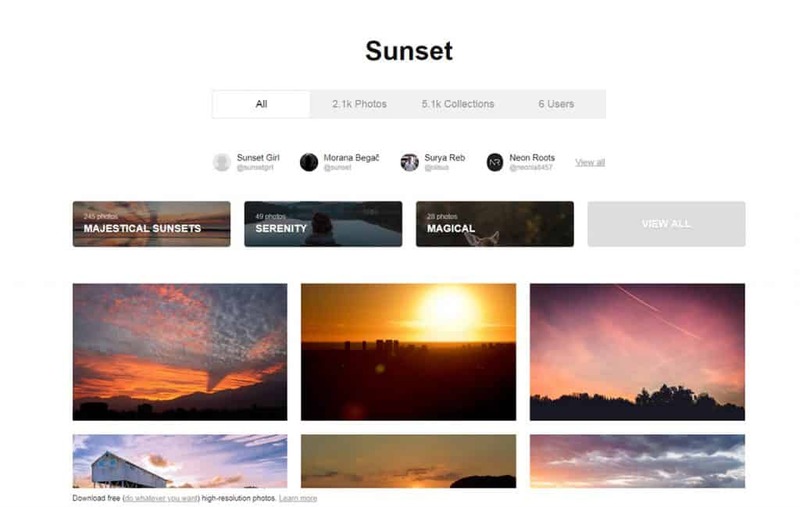 Find an image that you like, hover over it and download it to your collection. You can also easily make it your favorite or share with your friends. With more than 30,000 high-quality images, you can be sure that Pexels holds one for your blog post. All photos are added by users and from other sources that support Creative Commons images. Every month, you can expect 3,000 new images which are hand picked to make sure they really deserve their spot on Pexels. 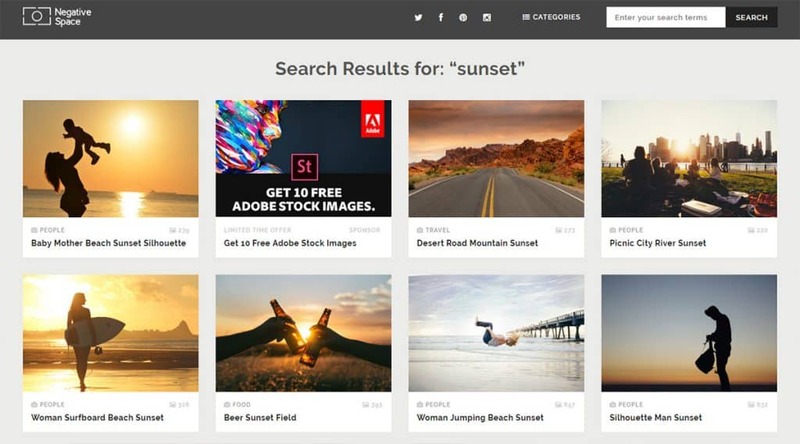 Powered by Shopify, Burst lets you search for free images that can be used anywhere you want. Whether you need a photo for a school project, a hero image for your website or presentation, we’re sure you will find one that you like. All images are completely free and can be used even in commercial projects and other online stores. Kaboom Pics features more than 5,000 images that you get to download for free. Every photo can be download in various sizes. The interesting part is a complimentary color palette that shows next to each image. By selecting a picture, you can also get the color scheme so you more easily design a page and make it perfect for that particular image. Good Stock Photos contains images taken by one man. There are new images added to the site on a daily basis, and all of them are free of charge. Browse through various categories or use a search function to find the ones that you like, and feel free to use them anywhere you want. There are seven new free images added every week on SnapWire Snaps. Scroll through images or use a simple yet powerful search feature to find the one that you like. 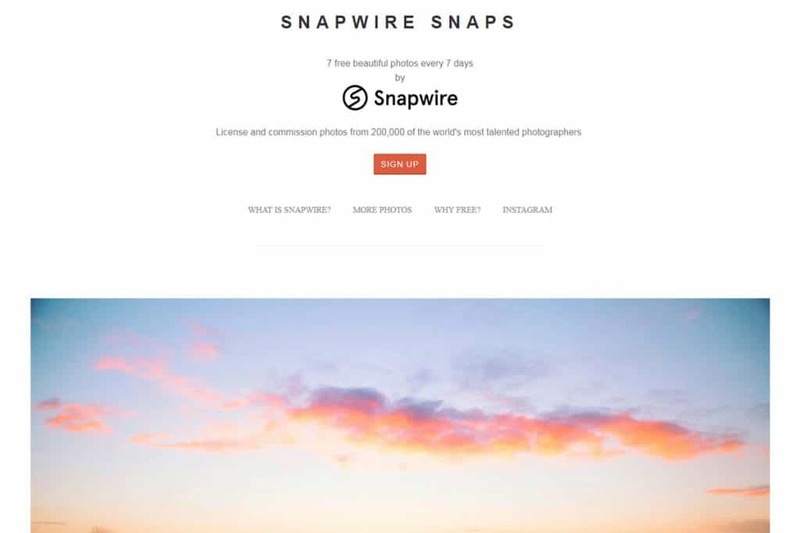 While the images are completely free, you can always choose to request unique ones or buy special collections from more than 200,000 on SnapWire. Sometimes, finding the right photo for your new blog post may be hard. 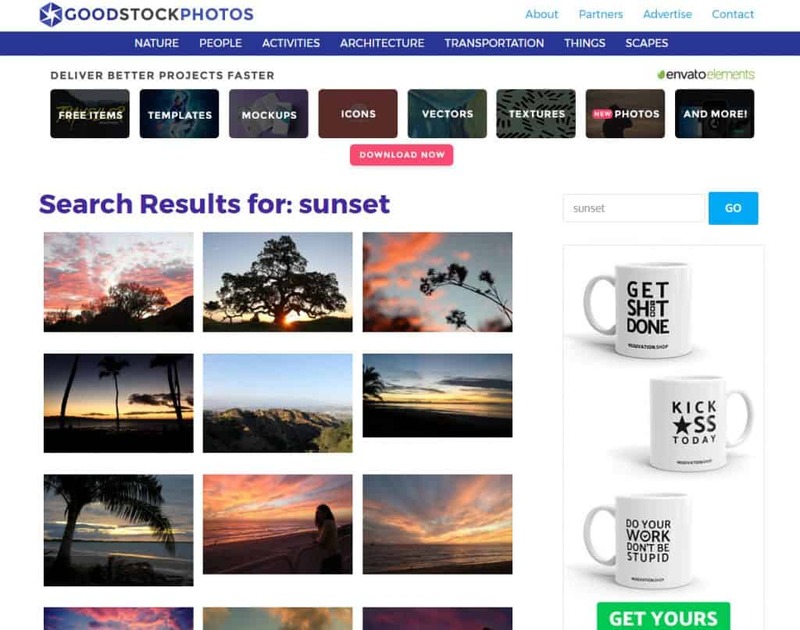 By having the list of fantastic free stock photo sites, you can make everything much easier. Just open any of the sites that you like, search for images and download them for free. Yes, it’s easy as that. Published on July 25, 2017 by Ivan; modified on August 27, 2018. Filed under: Anti-Stock Photos, Images, Photos. Can you please tell us how many images do you have on the site, how many photographers and how often do you post new ones online? Great resource. Is there a collection for free stock videos too? Don’t forget Pexels! That’s a great one too. Great post! Have you checked out http://www.iwaria.com ? We are a free stock photos websites focus on Africa. We help people discover the real Africa through lots of amazing images that anyone can use for their personal and commercial projects. I would be glad if you could add us to your list. ? I’ve just checked Iwaria – looks like a great resource. I will check it in more detail, and eventually add it to the list. Can you please help me out and let me know the details about the site (number of photos, photographers, and other stuff from the table)? Awesome resource here! I already use a handful of these sites, but will be adding others from your list to my rotation. You can never have enough FREE STOCK pictures that are actually worth using!